Sooo, a few weeks ago while everyone was still hitting up the sales, I decided to check out the new ranges in-store! (btw, I have nothing against sale shopping, I just find it so overwhelming in-store and the mess plays havoc with my ocd anxiety! Sale shopping online is so much more enjoyable!). For years now I've really struggled with finding anything in Topshop. I always see fab items online, but for ages could never find anything suitable in-store, so that always kinda put me off. But I always, always love to browse round when I'm in town, in hope that I will see something 'for me'. Then this particular day I was in luck and I completely re-sparked my Topshop love affair! Seriously, so much new stuff I love! I tried on loads and wanted everything, but I was strong and picked my favorite item which was this uber cool oversized rock tee! I love all the oversized tee's at the mo and you can pretty much find them everywhere! I just love the materiel, the faded black colour and the motif on the front of this one. When I say oversized. it's seriously oversized. I tried on the 8 and 10, but I did prefer how the 8 fitted. The 10 was, for me, a little too baggy, which I know, I know, is the look, haha! The 8 still comes up nice and loose and still a little baggy. If I wanted to wear this as a dress the 10 would of definitely been the one - but I know I wouldn't wear it as a dress, even though in my head I would be strutting around thinking I'm this super cool rock chick haha, but in reality - I'm not lol.... So I went for the size I felt I would wear the most and made me feel the best in! Which now has got me thinking what am I gonna team it with?! The most obvious that comes to mind is skinny jeans or jeggings and some ankle, knee high or sass it up with some over the knee boots! I've also been thinking how to work it for when it gets warmer and we can start getting our legs out and our pedi's on display! Below ↓ I am loving these long denim shorts from PrettyLittleThing at ASOS. I am always one for little denim shorts in the summer, but I am loving these longer length ones so much! Also, they would be more 'weather appropriate' around spring time, rather then getting the booty shorts out straight away! Ha! Also, from ASOS these gorgeous Gladiator Sandals with a chunky blocked heel (which is just perfect for me! I do struggle at times in stilettos - I have balance problems, hahaha!). And I'm also loving these tie flat sandals. You know I'm a sucker for a tassel and these for me would be the perfect summer shoe! So much detail, but being subtle at the same time. The neutral colour means they will go with everything! 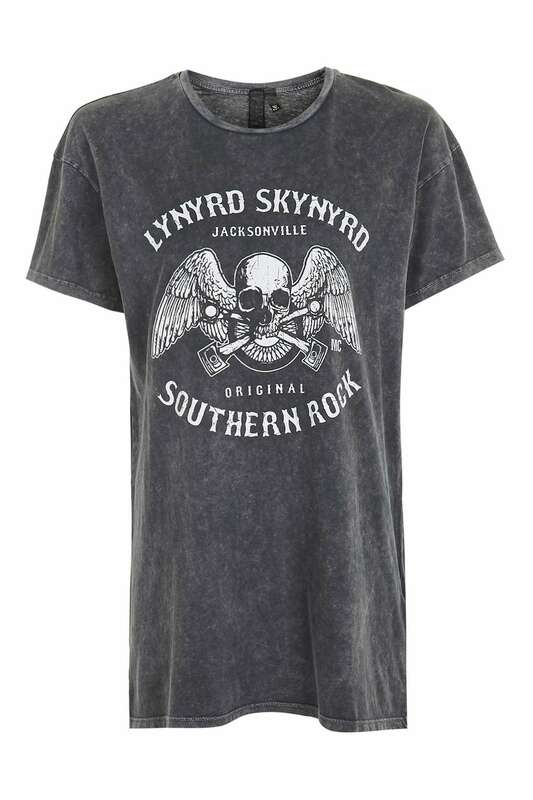 Another obvious item to team a 'rock tee' with is a bit of leather! I want to change it up a bit though - instead of the usual 'biker chick' leather trouser or mini, what about a leather look midi from New Look. I love a good pencil skirt - flattering and pretty much timeless. Get a leather one (real or pleather) and you will give the whole look that bit of edge the tee deserves! Or how about, completely random, but a floral embroidered mini. Embroidered skirts are so big at the mo and I reckon the trend will stay strong all year. Two completely different trends, but I reckon if you keep the accessories to the bare minimum these two together could work really well! I literally can't waiting to start wearing my new Topshop tee and I'm sure you're gonna see it pop up quite a bit over the next few months! Let me know, what you love to wear a rock tee with! I always love your comments and ideas!